Poker Stars may not be just as great as live dealer poker, but is just a great online poker room offering a wide range of poker games. With games ranging from $0.01/$0.02 micro stakes up to $200/$400 high stakes, as well as the sheer volume of poker game varieties available, finding a table is never challenge. The diversity of games alone makes Poker Stars stand out from the rest of the online poker rooms out there. The available games at Poker Stars are outlined in the table below. 2-7 Draw comes in single draw and triple draw. In addition to the games displayed in the table above, Poker Stars also offers a number of mixed games. 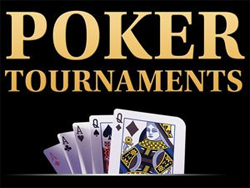 For the poker players that love the intense, stamina testing tournament style of play, Poker Stars also offers a wide variety of poker tournaments to play. Tournaments vary in size and game types and can be found at any time during the day. They hold many special events in which various prizes or seats in large tournaments are awarded, as well as free-roll tournaments and fake money tables for the poker fanatics who don’t want to risk their money on the tables. Overall, Poker Stars is a great poker room in which avid poker fans can find any game they want. The multiple choices of different poker games is hard to match on any other online poker rooms. 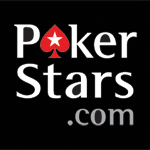 Professional poker players often frequent the tables, and many of them have given some great advice on various poker strategies, available to anybody via Poker Stars website. 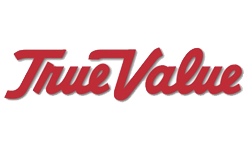 If you’re new to online poker you are probably asking yourself how come you haven’t discover this game any sooner, at least that’s what I asked myself when new to the game. I remember trying to play a game of online poker using Yahtzee rules… Close, but no good, and it goes without saying that I didn’t win a dime. So, let me briefly explain how online poker is played. First of all, you need to find yourself an online poker room where to play. You can search the world wide web for this as there are a plethora of affiliate sites waiting to be discovered by you, and to help you out finding a reliable online poker room. Use keywords such as ‘free poker’, ‘free online poker’, etc. and you might even find yourself a site where you can get a bankroll for free, so you can start playing online poker for REAL money. Once you’ve signed-up you can start playing. If you didn’t find yourself a free bankroll, or as a matter of the fact, even if you did, start with playing play-money poker games only. OK, you might not be able to cash-in this way, but it’s free, and prevents you from failing like I did (remember me saying Yahtzee?). And once you get the hang of it, you are free to do what you want. Play with the free given bankroll, or make a deposit. 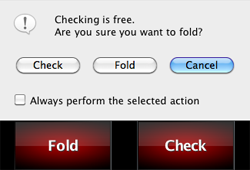 If you do make a deposit, make sure to go after a poker bonus. Even though this is usually the case at the majority of online poker rooms, not all poker bonuses are equally high. I you find an advertised bonus of say 100% up to $500, then look further, because numerous affiliates offer enhanced bonuses when you use their bonus code! Depositing at online poker room is just as easy as online banking, however US poker players will find it a little bit harder to fund their accounts due to a kinda stupid regulation called the UGEIA which came in effect mid 2006. Again, use Google or Yahoo to search for queries such as ‘US online poker rooms’ and the like. Common deposit methods are credit cards, e-wallets, and pre-paid cards. The nicest part about playing online poker is, of course, winning! So once you have won a significant amount, you can do two things. Either you cash-out your winnings, or you move up a level in stakes. As a beginning player, I would just cash-out the profit and buy my girlfriend/boyfriend a nice gift. Cashing out regularly gets done through e-wallets, bank wire transfers, or checks. 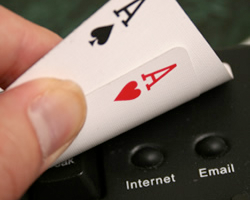 In rare cases online poker rooms offer the ability to cash-out to your credit card. Now, this is how online poker is played, be it in a nutshell. It doesn’t matter if you take my advice for granted, as long as you remember one thing, poker definitely ain’t Yahtzee!